Instead of focusing on what goes under the tree, we put our attention on the top — crafting an angel with a message of protest. The whole presents part of Christmas kind of seems like the biggest part of it, right? The average American plans to spend more than $900 on gifts this holiday season. That is planned spending, which we know is vulnerable to the last minute “oooh” factor, as well as the mistake of bringing your children with you to the store. In our house, we have been buying 50-cent mugs at Goodwill all year long. We are going to make toffee, fill mugs with toffee, wrap them in brown paper and leave it at that. With our families and co-workers, we do Yankee Swaps and Secret Santas, where it is “the thought” that counts — not grabbing the must-have toy of the year. This year, I understand that the hot toy is something called a Hatchanimal. It costs $60 (if you can find it), breaks out of its shell and then matures over a few days, learning from you as you take care of it. It is super adorable, and I am sure all three of my kids would love it enthusiastically, forsaking all other objects to be near it. That is, until they are distracted by dinner, a visitor or a particularly awesome cardboard box. That’s how quickly the beloved Hatchanimal becomes yesterday’s news. For the first time, my four-and-a-half-year-old son Seamus is excited about Santa. He used to think the bearded old gent was something out of a nightmare and stayed far away. Last weekend, however, he marched right up to a Santa at a holiday festival and started chatting about how he would be in Michigan, not Connecticut, this year. Our affable son told the jolly elf that he would leave out cookies for him “on a plate with milk for you! And carrots for your reindeers too.” Seamus then sat down for the obligatory photo and kept right on talking. “I have had very good behavior, right Mommy?” He grinned up at me like he was not the one who had taken to yelling “I am ignoring you,” when called for dinner. He and Santa chatted on, but they never got to the heart of the transaction — presents. Seamus didn’t ask for anything and this Santa (probably because it was at a Heifer International fair and all about giving not getting) didn’t offer. They shook hands and parted as friends, with Seamus calling, “See you soon, Santa” as we walked away. I could not have been happier if I scripted the whole encounter myself. If it is not about the presents, what is Christmas about? Baby Jesus, the festival of lights, lots of getting together with friends and family, lots of craft making time — ’tis the season of glitter, God help us! Oh yeah, and taking care of our Christmas tree occupies a lot of our holiday time. The kids are climbing up on the sofa 10 times a day to put new ornaments that they made or found onto our rickety $20 tree. It has already fallen over once, smashing all the really nice ornaments we’d been given and running a huge stream of water through our living room. The kids shimmy under the tree all the time too, checking the water, fussing with the lights, hiding from one another. There is room for them to do that (although it is probably why it fell over in the first place) because there aren’t any presents under it. We put more of our attention on the top of the tree than the bottom. I make a new tree topper every year, one that expresses our visions or outrages of the moment. Last year, I enlisted a favorite doll in my “refugees are not terrorists” angel. In 2014, Seamus and I worked on a “Black Lives Matter” angel with feathery paper wings that layered the word “breathe” with squares that he scribbled and glittered. In 2013, I did it alone, using fragments of Martin Espada’s “Angels of Bread” poem and scraps of newspaper articles. This year’s angel holds a protest sign that reads “Trump is not my president” and wears a dress made of strips of denim festooned with protest buttons. Seamus and his younger sister Madeline collaborated to color in the angel’s wings, but when I put it all together, Seamus didn’t want the angel to hold a sign. Seamus probably stopped listening a third of the way through all that, but I was proud of my exposition on angels. It made some impression because he did make the wings beautiful. They are very orange, though, which is not a color I associate with Christmas (or want to associate with it, given the president-elect’s complexion). 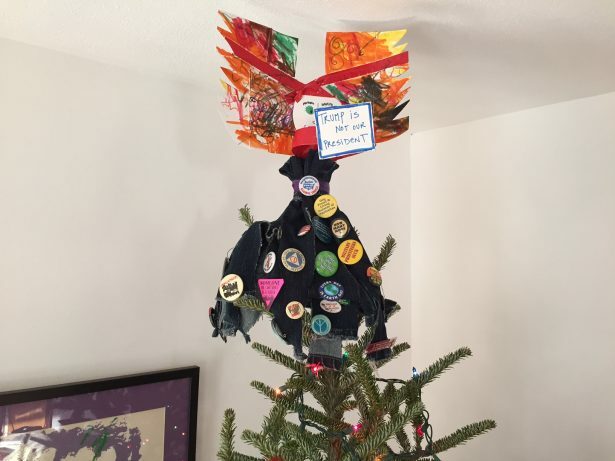 Our four-year streak of tree-topper as homemade political statement isn’t really going to change the world. But we do it together. It is part of our Christmas now. That and not having a lot of presents under our tree. My holiday present this year came in disguise: I was banished from my workplace for several months and told not to come back until I moved into a better apartment that was free of insects. That was just the right incentive I needed to move out of that rathole and improve my life. The new apartment has made me so happy and full of joy that I can say with no uncertainty that my spirits have been lifted higher than ever before. I have not felt this happy and safe in decades. And I don’t even believe in spiritualism. Hi Ho! The personal is political! but, these call for a connect-in installing).